Non-university live jazz shows are sort of like the Iberian lynx of Springfield music; they’re pretty and critically endangered in numbers. There are those occasional rays of light, though, such as Monarch Art Factory ( show this Saturday. 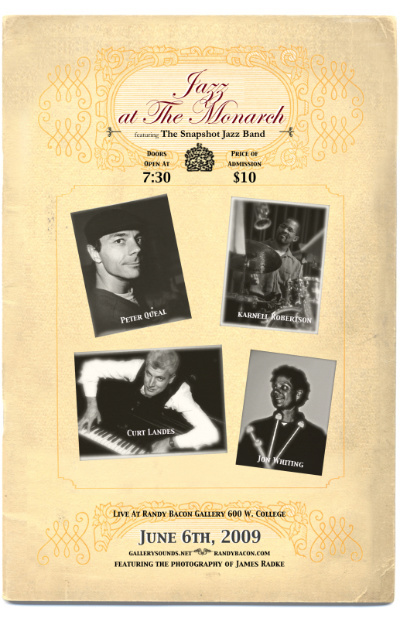 The Snapshot Jazz Band, consisting of guitarist Peter Queal, keyboardist Curt Landes, drummer Karnell Robertson and John Whiting on vibes, will perform with accompaniment by the photography of James Radke. The cost is $10 to get in, which includes complimentary refreshments. Doors open at 7:30 p.m., and the show will likely begin soon after that. If you don’t know how to get to the Monarch Art Factory (which houses Randy Bacon Photography Studio & Gallery, among other businesses), click here for a map and directions. So Palen Music did something pretty cool…they had a battle of the bands—and it rocked! A total of twelve bands played on the competition stage. All while HUGE sales were going on and (on top of that) bands were jamming on the upper level inside the store. Being a customer of Palen for over 10 years, this was pretty cool to see. The event had a panel of judges so it WAS NOT a popularity contest. Huge props to Palen for that. Thanks to Palen for putting the event on and to Quinn from Palen for organizing and making the event run smoothly—even after the weather turned and we had to move inside. More info and see who won after the jump.